In the south-east part of Sweden, on the shore of the Baltic Sea, lies the old city of Kalmar. The castle has been standing there for eight centuries. Its name derives from the city's name. 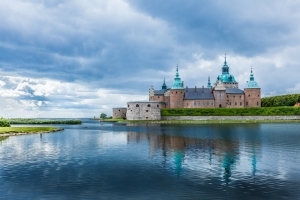 In medieval times Kalmar Castle was called the “key to Europe”. 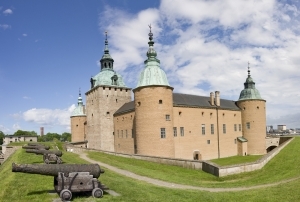 It was considered to be one of the most important strongholds in Northern Europe. 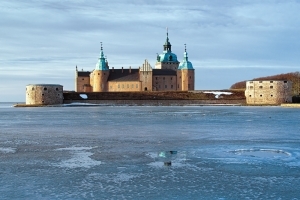 For many years the castle had been a border stronghold and played an important role in Scandinavian policy, and today it arouses great interest among tourists as well-preserved fortifications and an art object of the Renaissance period. 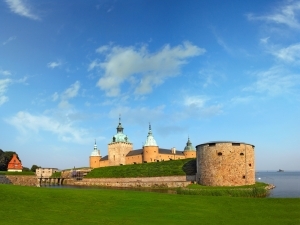 The beginning of Kalmar Castle is linked with constructing a watch tower which appeared by the end of the 12th century in the place where the city of Kalmar is located today. At that time plunders by pirates from Karelia and Finland were common so a tower with a high wooden palisade was built for a defence against them. In the 13th century Kalmar was in its heyday as a trade city, rich merchants from Hanse and Lübeck did business there. Kalmar's town seal that made important trade and political agreements legally enforceable dates from 1255-67 and is the oldest seal of Scandinavian countries. Brilliant restorers had been working for several decades to restore the historical appearance of Kalmar Castle’s old interior. As a result, this building can be considered to be the most popular Scandinavian castle. Tourists who go for a trip here can see renovated chambers where monarchs used to live. The Hall of King Erik XIV, a famous art patron and connoisseur, is in the Royal Tower. The panelling separated from the ceiling with an edge of colourful murals gives this chamber a beautiful and impressive appearance. On the left of the fireplace in King Erik's Hall is a door to a secret passage where Erik was able to get directly to the roof. King John III’s apartment bears the name "rainbow-coloured" because of the ceiling sparkling in turns with green and gold. Unfortunately, this gilded ceiling was damaged when the castle was used for utility purposes in the 19th century. Today the 16th century hall is used for various ceremonies, events and concerts. In the East Hall, which is the biggest chamber, royal parties and banquets were held in medieval times, today many museum items are kept here. A chapel was built in the castle’s south wing during John III’s rule. The construction of the chapel ended in 1592. It is worth noting that the part of the oldest wall from 13th century that survived was merged with the outer wall structure. 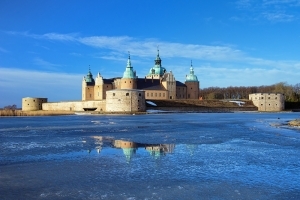 Many rulers of Kalmar Castle prayed in the castle's chapel, and today this is a place that enjoys great popularity among brides and grooms who want to experience their wedding ceremony in an unusual, romantic atmosphere.